The 3 Ravens brewers have been playing with their favourite American hops to create another in their series of annually released double IPAs. But it's not just the year or the look – now a black can coated in neon swirls – that's different this time around; as the name suggests, it's a heavier, fuller beer than the lean machine that has appeared in the past. According to head brewer Brendan O'Sullivan, the revitalised Schooner malts they used lent the beer a more prominent malt sweetness, bready with a little toast and caramel in there too. The result is to soften the impact of the Simcoe, Citra and Mosaic hops (the use of a London ale yeast may well have contributed to the beers relative voluptuousness for the style in this day and age too). 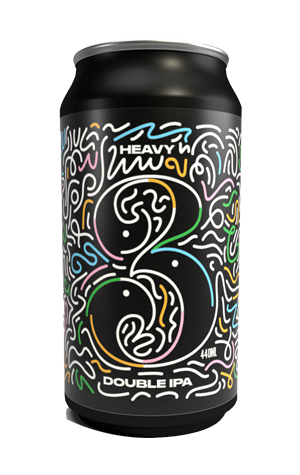 That said, you'll still pick out a veritable fruit salad of hop characters in there, not to mention a dank quality in keeping with the "Heavy" moniker. But they're delivered in tandem with the richer malt characters you'd find in the sort of double IPAs to come out of the Pacific Northwest a few years back. UPDATE: Version 2 follows in February 2019, with a reimagined malt bill and more Old School US hop varieties, Columbus, Centennial and Amarillo. And it's a vastly different beast: far paler in colour, dryer and lean to the point of being almost delicate on the palate. While there's a little fruitiness, the hops deliver more on the piney front and the malt flavours are lightly toasted rather than chewy, with bitterness also restrained.